This link: takes you to the dedicated CSZ page with closeups so you can see things happening in as much detail as you like. I find this Pacific Ring Of Fire view interesting… there is activity all over the place including a rather large aftershock near Vanuatu. A ‘static image’ that captures the several 5.x quakes scattered all over Asia / Pacific, including the string across the middle. As New Zealand had some activity recently, I’m leaving this closeup in place. Just so it’s easy to keep an eye on it. I’m promoting the Australia / New Zealand / Indonesia map up here to it’s easier to keep an eye on Indonesia as a broad active area. I felt the 3.x on the San Andreas near me but it wasn’t enough to get me looking at the quake page. Still, we’ve got ‘action’ in the Golden State. Note the cluster up near Geyserville is still very active. As I live in California, it makes it easier for me if I keep them in the list where I can see what’s shaking near me. This page lists historical quakes by year, with news headlines too. I’ve pointed the link at 2011, but other years are there to choose too. Original Image, and with other language options. This entry was posted in Earth Sciences and tagged Cascadia, quakes. Bookmark the permalink. Well, let´s give time to time and it seems that Seattle´gulf will get united with the Gulf of California, from Anderson Island in the north to Montague island in the south. It’s nice to see that after a quite period Katla is “swarming” again. Same goes for El Hiero Volcano which has been quite for a shor period of time as well. 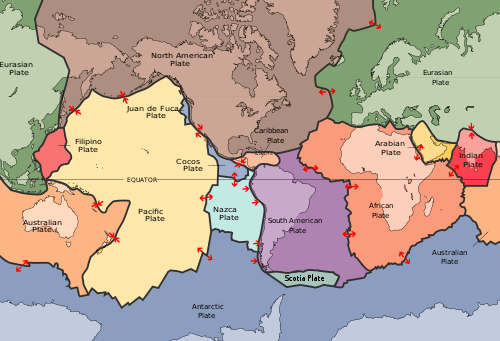 For correspondence with the global map, the largest five earthquakes are also labeled on the bar graph. These plots show that while the largest earthquakes in the historic record have occurred close together in time – first during the 1950’s and 1960’s and again since the turn of the 21st century there has been no appreciable increase in the rate of energy release between these large events, as indicated by the parallel red dashed lines. A statistical analysis of these data also shows that there is no meaningful, statistically significant clustering of M>=8 earthquakes in time. has many graphs, but a quick scan looks like they are mostly regional / local. Seismic energy release during the precursory, eruptive and declining stages of volcanic activities provides various information about the mechanisms of volcanic eruptions and the temporary developments of their activities. Hitherto the energy release patterns from precursory earthquake swarms were used to predict the eruption times, especially of andesitic or dacitic volcanoes. In this paper the discussion is expanded to quantify the total amount of seismic energy released at the threshold of volcanic eruptions, with reference to the results observed at several volcanoes. The results generally indicate that the cumulative seismic energy release from the precursory earthquake swarms exceed 101718ergs before eruptions at any andesitic or dacitic volvanoes. This allows the seismic efficiency, or the ratio of energy radiated seismically, and the energy required for the volumetric expansion to be estimated by incorporating available deformation data with the seismic data. The dependency of seismic efficiency on the type of volcanic activity, i. e. non-explosive outbreaks, phreatic and magmatic eruptions, dome formation, etc., was evaluated from observations at a few volcanoes that provided a variety of examples. The coronal holes appeared on cue across the centre of the solar disc on Feb 1st – as reported by Spaceweather.com http://bit.ly/xeJiVV . A Major earthquake then hit Vanuatu, South Pacific on Feb 2nd (M7.1 – the largest in the world for 3 weeks) and many aftershocks followed. All quakes larger than M5 on Feb 2nd were in the Southern Hemisphere. Significant weather events expected by WeatherAction – driven by the top level solar effects in our ‘R5’ Red warning – also appeared on cue such as an icy easterly blast in Italy in our Euromaps forecast and exacerbation of snow deluges in North New England USA. Big chance these quakes are related to the Negros Islands volcanic belt as quake depth varies from 46.6 to 10 km. DATE links are into the IRIS WILBER system where you can see seismograms and request datasets. First reports about people killed due to collapsed buildings after the first 6.8 quake took place. PS: Thanks for help EM on earlier request, above. An ‘eyeball’ of that top graph looks like a match to the ‘cold 70s’ and like an inverse of sunspots… as a first guess.. Thanks, I’d missed that one. Looks like a 6.0 off the coast of Oregon today, too. That is just a ways inland from the point where the major Cascadia fault heads out to sea..
At this point, I’d not plan any visits to the area from Oregon to British Columbia if I could avoid them (within about 50 miles of the coast) and if I lived in that area, I’d be reviewing my emergency kits, bugout bags, escape routes, etc. What’s really problematic is the fact that these were very shallow quakes. Lots of devastation when the bigger events hit. causes intense seismicity in the Northeastern (NE) Japan arc. The larger the quake, the larger and longer the aftershocks. As the last one was Way Big, it would be expected to produce thousands of aftershocks for a very long time. Still, it is likely to be part of a longer term ramp up. But the one that surprised me most was this one in Canada! Quebec? Really? QUEBEC? Near the St. Lawrence? That California map, near the bottom, has been running at “Over 400” for a while now (presently at 419) and with a lot of the activity clearly ‘inland’ on the rift zone near the Basin and Range / Nevada / Death Valley / Salton Sea or over on the “Calaveras / Hayward” system. The California map is up to a 428 count, so rising numbers.